ALBUQUERQUE, N.M. — Sandia National Laboratories is working with three industry partners to commercialize a distributed power system that can produce cheaper, cleaner, more efficient electricity. 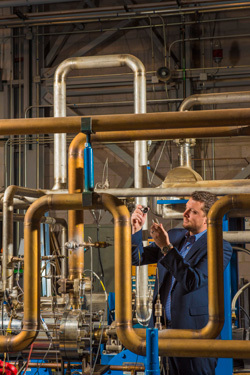 Sandia National Laboratories principal investigator Darryn Fleming is surrounded by the workings of the labs’ 1 megawatt thermal supercritical carbon dioxide recompression closed Brayton cycle test loop. “High temperature and pressure testing with supercritical CO2 is complex and testing is expensive and high risk,” Fleming said. “We’re set up to do multiple large-scale demonstrations that use high temperature and high pressure.” (Photo by Randy Montoya) Click on the thumbnail for a high-resolution image. The labs signed three-year Cooperative Research and Development Agreements with Peregrine Turbine Technologies of Wiscasset, Maine; Xdot Engineering and Analysis of Charlottesville, Virginia; and Flowserve Corp. of Irving, Texas. Sandia is developing supercritical carbon dioxide (S-CO2) recompression closed Brayton cycle technology, a power generation system that could yield thermal-to-electric conversion efficiency as much as 50 percent greater than conventional steam technology. Brayton cycle is named after 19th century mechanical engineer George Brayton, who developed his method of heating air in a confined space and releasing it to generate shaft power or thrust, like a jet engine. The working fluid for Sandia’s Brayton cycle is S-CO2, which is chemically stable, low cost, non-toxic, non-flammable and readily available. “It’s basically a jet engine running in a closed loop with S-CO2 as the working fluid,” said Darryn Fleming, Sandia principal investigator for Advanced Reactor Technology in the Department of Energy’s (DOE) Supercritical Transformational Electric Power program. The most common power cycle, Rankine, boils pressurized water to create steam, which is then expanded through the turbine. The cycle efficiency is about 33 percent, or 33 percent of the thermal energy delivered to the fluid is converted into electricity. 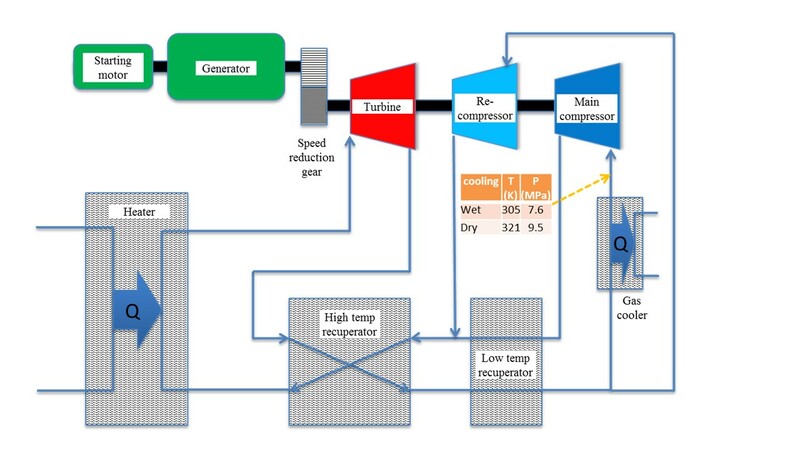 The reason for higher efficiency in an S-CO2 Brayton cycle is that a sensible temperature difference between the hot turbine discharge and the cold compressor discharge drives heat transfer within the cycle, which provides the vast majority of the heat addition to the high-pressure fluid. The heat rejected while condensing steam at constant temperature in a Rankine cycle is avoided. 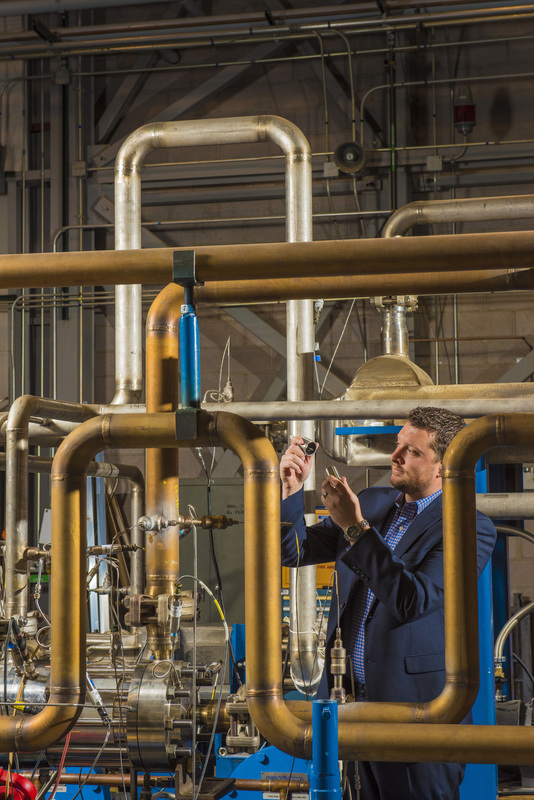 Sandia has been testing various components, bearings, seals and heat exchangers near or exceeding the critical point where carbon dioxide’s density is close to a liquid but with many properties of a gas. Tests showed several elements of the system hadn’t reached technology maturity. “To get this to market, we needed to increase the technical readiness level of numerous components and procedures, particularly seals, bearings and heat exchangers,” Fleming said. Sandia posted Federal Business Opportunities ads seeking industrial partners, and Peregrine, Xdot and Flowserve were among multiple respondents. The illustration shows a recompression closed Brayton cycle with arrows indicating the flow of supercritical carbon-dioxide (S- CO2). Starting at the lower left corner, S-CO2 is heated and sent through a turbine where energy is extracted. It then goes through recuperators, also called heat exchangers, where the hot S-CO2 transfers heat to the colder S-CO2. The S-CO2 flow is then split between the compressor and re-compressor and redistributed back into the system. (Illustration courtesy of Sandia National Laboratories) Click on the thumbnail for a high-resolution image. Sandia offers its partners a 1-megawatt thermal S-CO2 recompression closed Brayton cycle test loop that can run dynamic tests along with dedicated test rigs for bearings and seals. Sandia’s testing helps the companies prove their technologies work with supercritical CO2. All three companies have made strides and developed prototypes with Sandia’s technical input and testing made possible by the CRADAs, agreements between a government agency and a private company or university to work together on research and development. Stapp said collaborating with Sandia’s experts has been invaluable. “I couldn’t be happier,” he said. Brayton technology can use solar, biofuels and natural gas to produce electricity for the distributed energy market, Rochau said. Distributed electrical generation is the production of power at or near point of use versus at a large-scale, central generation location requiring long-distance transmission and local distribution. Transmission and distribution typically accounts for half the cost of delivered electricity.